FFWPU France: This summer camp has been held for 6 years in a row now and it has become a major summer event for the French Second Generation members as the years have gone by. 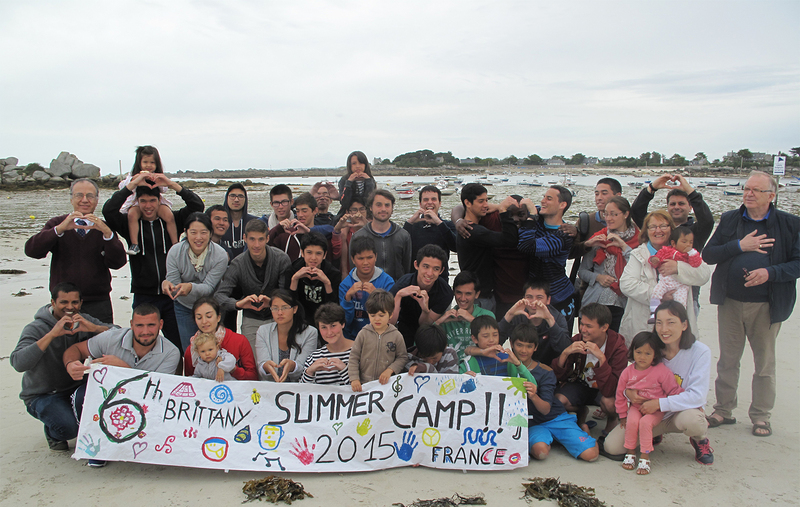 Indeed, this 6th session (The 2015 Brittany Summer Camp), which took place in the northern part of Brittany, has brought together more than 40 Second Generation members. The camp was held from August 8-16, 2015 under the topic “Ocean Providence”. A Young Unificationist member, Jonathan Burt, launched the project in 2009 and it has constantly improved year after year. The first summer camp in 2009 was held in a small garden with only few Breton church members. The WS was then held in a small campsite and it has finally taken place in a luxury 3-star campsite, very near to the Atlantic Ocean, these past years. What was just a small event for the Brittany church community has now reached the national level and we were many Second Generation members coming from all parts of France. The participants (aging from 9 to 25) had the opportunity to participate in several activities such as beach volley, a challenge day, a treasure hunt, etc. The activities were appreciated by both the young ones and the less younger. We suffered from a thunderstorm and from heavy rainfalls but that was necessary to fully appreciate the sun rays. We started off each day with a morning sport on the beach, a perfect way to enjoy the beauty of the rising sun. The morning sport sessions were followed by HDH with Father’s words on Ocean Providence. The meals were entirely prepared by the teams and each team was evaluated by the other ones. The teams were not only evaluated for the meals but for all the activities, creating a competitive yet friendly atmosphere, reinforcing the quality of the WS. At the end of each day, the teams would gather and they had to fill a “souvenir booklet” with drawings symbolizing the day that had just past. We would then close each day playing card games or with a quiz. Eventually, the 6th Brittany Summer Camp ended on Saturday 15th with a prayer vigil followed by the release of 20 red lanterns just above the sea, in the starry sky. There are other activities such as the testimonies given by Jonathan Martin on his trip to Korea, France-Pol Ladouce and others. Parents also supported a lot. In addition, the manager of the Camping provided structure, such as tables and chairs and two refrigerators, free of charge.